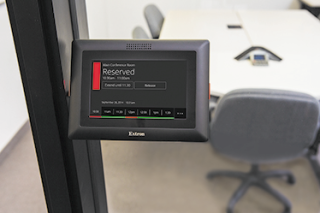 Extron Electronics has introduced Room Scheduling, which combines easy-to-use Extron Room Agent setup software and TouchLink Pro touchpanels into a full-featured room scheduling system. "Room Agent software further enhances our TouchLink Pro touchpanels by transforming them into convenient room booking appliances," said Casey Hall, Vice President of Sales and Marketing for Extron. While competitive devices rely on additional scheduling software or external processors, Room Agent ties TouchLink Pro touchpanels directly to Microsoft Exchange, delivering a convenient stand-alone room booking solution for any size application. Users can reserve rooms from any Exchange-connected device, including their mobile devices or from the touchpanel. Since Room Agent uses Extron’s popular 5” and 7” TouchLink Pro touchpanels, multiple mounting options are available, including on-wall, in-wall, as well as secure mounting to almost any flat surface, including glass or granite. "Room Agent software further enhances our TouchLink Pro touchpanels by transforming them into convenient room booking appliances," said Casey Hall, Vice President of Sales and Marketing for Extron. "Room Agent software is free, and makes setting up your touchpanels easy. Once you've modified the interface to your liking, users can simply tap the screen to book a room." With Room Agent, the TLP Pro 520M, 720M, and 720T TouchLink Pro Touchpanels require no programming, as they?simply operate as a client of Microsoft Exchange. Booking a room from the touchpanel is as easy as tapping the “Reserve” button for the time you want. The intuitive interface clearly displays room availability and a timeline view of the room’s occupancy status for the rest of the day. In addition to the customizable touchpanel interface, bright LEDs within the bezel make it easy to see if a room is occupied or available, even from down the hall.